The most commercially well-known and broadly-practiced line of MG Taylor's products and services is the DesignShop Event. The DesignShop represents the minimal complete expression of the System and Method in that it integrates and contains elements from all six Subsystems. This mature mix of products and services includes elements of environment, process and augmentation tools (as well as WeakSignal Research products, electronic and physical event products such as event journals, communication documents, and project plans and support tools) and are what now comprise our Generation I offerings. Additionally, MG Taylor has evolved the DesignShop Event and related products and services into a nextGen℠ or Generation II Suite of Solutions that are as much an advancement on Generation I DesignShop methods as the Generation I DesignShop was on other collaborative methods in the 1980s. Currently, the nextGen Suite has been developed exclusively for some designated clients only (who are actively investing in the developmental costs), and we are not disclosing those details at this time. There are five Types of DesignShop Events and two types of related events, DiscoveryDay℠ and SponsorSession℠ Events. These different types relate to the scope, scale, complexity, systemic nature and degree of employment of the mix of the six Subsytems in their application. The delineation of these types is not meant to infer a hierarchical or "goodness" structure. They simply represent types or classes of DesignShop Events. It is the criteriea listed for each type that determines what type of DesignShop Event would best be employed, given the circumstances. 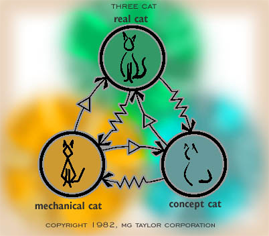 The Three Cat Model is, on the top level of recursion, the basic engine of a PatchWorks Design exercise. Multiple iterations of “three catting” are necessary for true emergence to occur. For complex problem and opportunities, the PatchWorks Design exercise, ValueWeb organizational structure and navCenter™ facility all are co-dependent concepts and make up mutually supporting capabilities. It will take a network of navCenters to tackle the many large-scale work that needs to be done. What problems — if solved well — would make a significant improvement in the state of the world? In our System and Method, we recognize that problems are created — not given. Too often, they are confused with conditions. Since we humans tend to solve the problem we create, it is important that we take great care in the choosing. Inappropriate problems - or improperly defined ones - can lead to disastrous “solutions” full of unintended consequences. Good problems are surprisingly hard to come by. We have researched, studied, thought long about this — and about the criteria of what makes a good problem and a good outcome. A good problem is definable and solvable. It is useful when solved. It is something that those who work it are passionate about. A good solution is sustainable. It produces both individual wealth and commonwealth — in balance. It is an appropriate response to the conditions that fueled it. It is practical and an expression of art. It is economical and ecological. It is fun to do — it is recreational. It augments life in all life’s forms. It demands learning and improvement and does not come easy. It requires the best of all who are involved — it transforms. A Worthy Problem is a special class of problems which exhibit the following additional characteristics: they address systemic issues on multiple levels of recursion and generate Worthy Projects which produce viable solutions that resolve long-term/short-term, local/global, economic/ecological “conflicts.” The practical/ideal dichotomy is defeated. The purpose of the environments we build, be they navCenter Systems, offices or a RDS System, is to facilitate Humankind’s ability to identify and solve Worthy Problems. Every one of these environments have to “earn a living” by augmenting the work and financial well being of the organization which operates them. As a network, however, they make a capacity that has never existed before on Earth. This is the function of the ValueWeb architecture and the promise that the complex, systemic conditions, that now plague us, can be recreated into problems that meet the specification stated above — and then, that these problems can be dissolved (not “solved”) generating unlimited opportunities. The immediate focus of our work is to support those, whom we call Transition Managers, who have developed competency in both the “old” world systems and the one not yet born by dedicating their skills and effort to facilitating the transition from one to another. From the beginning of this work in the mid 1970s, to now a global transformation of humanity was a given. The question was at what cost and to what outcome? For a list of what our current thinking leads us to believe are worthy problems, click here. These are the ones that are at the heart of our Human Enterprise. Each is worthy; altogether, they make an architecture that suggests a significant agenda for the first period of the 21st century. Following our criteria, they “call” us to action. In different ways, the projects that will make the next quarter century of our work will address these problems with both means (to get at problems such as these) and solutions (examples that demonstrate the specific, practical solution and provide a general approach to the class the problem represents). We have been thinking about these problems for many years, and will continue to document them as time goes on. These long-intended ideas will, thus, be recreated and restated in contemporary terms, as an exercise in an ongoing re-defining of our future work. Many will resonate with these Worthy Problems yet this is far from a complete list. We do not offer these as the only issues which should be addressed. There is plenty of room for more. Remember there are two definitions - the integrity of which should be respected - involved here; first, the definition of a real problem (which is created out of a circumstance and a desire), And second, the sub-set of real problems which we call Worthy. This does not mean that other problems are bad, inferior or not worthy. We use worthy merely as a means of addressing those class of problems which allow us to simultaneously work globally and locally, systemically and specifically, idealistically and pragmaticly. All of these are in reality the same. Each of us has to follow own vision and passion and when we do so with insight and integrity it will be seen that there is a worthy aspect in everything we do. Linear financial planning is not strategic planning, but if an authentic strategic plan is first developed, it then provides a rational set of criteria for why and how much to fund the projects and activities that will implement the strategic plan. The Type II DesignShop Event is the appropriate application of the Taylor System and Method for developing an organization's strategic plan. It is also the appropriate type for designing and planning for the execution of mergers, new product launches and other projects that will have a long-term, strategic impact on an organization — or even its market. In today's complex, rapidly-changing world, organizations must be agile, adaptable, anticipatory, self-correcting and able to impact their market in order to just survive — much less be successful leaders in their field, optimize market share and operate efficiently. Sometimes this takes a complete trasformation of the organization, its market or the industry, in which it operates, to accomplish. The Type III DesignShop has been used with much success in the design and planning of focused, tactical problems such as SAP and similar information technology implementations, navigating through the legal, financial, regulatory reporting and accounting hazzards of materiality across a number of business and industry sectors, the prevention of hospital-acquired infections in healthcare, and creation or improvements in products, services and business or technical processes. Any problem an organization faces that does not involve complex, systemic or trasformational change is appropriate for a Type III DesignShop event. 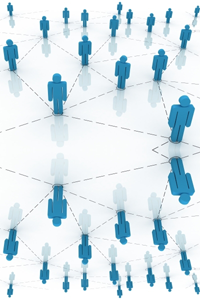 Its usefulness above other collaborative methods lies in the time compression, parallel processing, and the synchronous participation of all stakeholders, resulting in much shorter cycle time to market or implementation, and better solutions requisite with an appropriate response to the problem being solved. 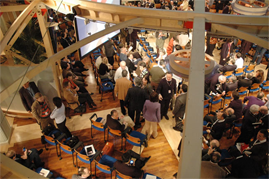 The WorkSpace at Davos, Switzerland (established 2005) is owned and used by the annual World Economic Forum to design and plan specific projects and partnerships of an international nature. 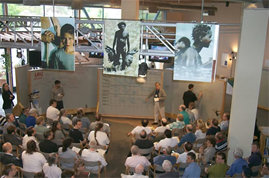 Designing and planning in a session in the WorkSpace has become a high priority for many participants at the Forum since we introduced it in 2001 (using one of our portable Rapid Deployment Solution™ Systems , or RDS™ Systems). The reason for this, as expressed by the participants, is the power of "collaborative innovation at its best" (play video at left) among all stakeholders to rapidly develop a complete iteration of design and planning. Extreme time compression to accomplish strategic/tactical, and highly-focused goals and outcomes. This type of event can be seen as a module "inside" of a larger, more complex program. It follows a process structured around a very refined event design accomplished by a senior facilitator/event designer. It is supported by a KreW of advanced-competency, flexible KnowledgeWorkers, each of whom have developed, demonstrated and practiced a broad set of skills, craft and an attitude requisite with the intense level of service this type of event demands. Often, in this type event, there will be a person who, by virtue of leadership, sponsorship or content and context expertise, makes the logical and most expedient choice to facilitate the event. In such a case, the KreW will coach this person prior to the event and give very close support during the event. In the case of the approach being used as the primary mode of education in an educational organization such as a school, college or university, the MG Taylor System and Method must be transferred to the faculty and adminsitration through our licensing process. All rights to licensing and transfer are reserved exclusively to MG Taylor Corporation. In the case of the approach being used in a "one-off" specific education or training course or class (whether or not it is recurring), the teacher/instructor will either be an experienced Facilitator/Knowledge Worker, or will be coached and strongly supported by one or more such Facilitators/KnowledgeWorkers. This can only be done with the knowledge and approval by MG Taylor Corporation and an agreement, which includes a non-discloure agreement and acknowledgement of entitlement to a single-instance use license, must be signed by the teacher/instructor and an authorized agent of MG Taylor Corporation prior to receiving coaching or support. The Augmented Meeting, or Type V DesignShop Event, is the simplest employment of the environment, processes and augmentation tools of the Taylor System and Method. Yet, it requires the same rigor as the more complex event types. It requires a meeting facilitator, perhaps assisted by a KnowledgeWorker, a design for the meeting (process), an appropriate environment and requisite augmentation tools. It requires documentation (which the team may do themselves). 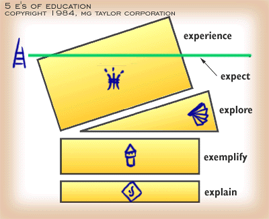 As with all of the event types, it employs the MG Taylor 10-Step Knowledge Work Process. 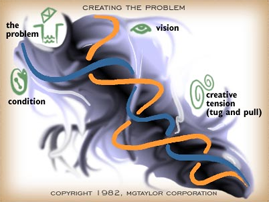 A Taylor environment may not be available, so the environment available should be designed and arranged in a manner consistent with and conducive to making a creative, innovative atmosphere in which GroupGenius℠ can be released. The same is true for the required augmentation tools. 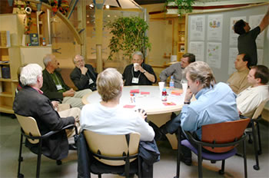 The Type V event is appropriate for small team meetings, such as project teams, work group teams, or other small ad hoc teams. The DiscoveryDay takes place after initial contact and preliminary discussions have taken place. An initial Sponsor Team will be assembled and come to our facility for the DiscoveryDay Event, which takes most of a day. The DiscoveryDay serves a number of purposes. It allows the Spnsor Team to experience something of what a DesignShop Event would be like. It allows the Sponsor Team and the MG Taylor Facilitation Team to delve more deeply into the problem the Sponsor Team thinks it is bringing to the table, to analyze, clarify and to either expand or contract the scope, scale, complexity and systemic nature of the problem, and therefore to choose the most appropriate DesignShop Type to effectively solve the problem. It allows the Facilitation Team to understand what is on and off of the table within the scope. And it allows both MG Taylor and the prospective Client to have a rational basis for going forward with an event — or not. The costs are shared: MG Taylor provides its facility and Facilitation Team as well as the food during the DiscoveryDay (generally, a light breakfast, a healthy lunch and snacks and beverages throughout the day); the prospective client pays for their own travel costs to our facility location. There are four types of SponsorSessions. The day before a DesignShop Event with all participants, the Sponsor Team is taken through (we also call this the "Walk-Through") the design for the whole event, paying close attention to the detail of Day 1 of the Event. The Facilitation Team and the Sponsor Team then go through a round of co-design to incorporate the insight and knowledge of the Sponsor Team into the various modules of the Event's first day. This is then repeated each morning of the Event, before the participants arrive. The second type of SponsorSession is at the close of each event day to review the day, the progress being made, and to review the design for the next day so that any needed adjustments can be made. The morning after the end of the Event, the Sponsor Team meets with the Facilitation Team to get overall feedback on the the progress made, the outcomes achieved and the goals attained. Then there is a dialogue and decision on the nature of the documentationa nd work products to be produced by the Facilitation Team. Finally, there is dialogue around exploration of decisions for next steps by the Sponsor Team and MG Taylor. This is the third type of SponsorSession. The fourth type is generally virtual meetings through teleconferencing before and/or after the Event.